Catholics believe Jesus is a Mama's Boy. John 2:4 Jesus saith unto her [Mary], Woman, what have I to do with thee? mine hour is not yet come. Romanists do not worship the Mary of the Bible but one of their own imagination who is based on an ancient pagan goddess. Catholics call their Mary, "The Queen of Heaven". This pagan goddess is found in Jeremiah chapters 7 and 44. God hated worship of the queen of heaven. Papists say that you can only be saved by grace. That sounds good don't it? Well, you can't trust the Great Whore of Revelation to tell you the truth. You have to go deeper after hearing each statement. The grace that they speak of must come through Mary, not Jesus! 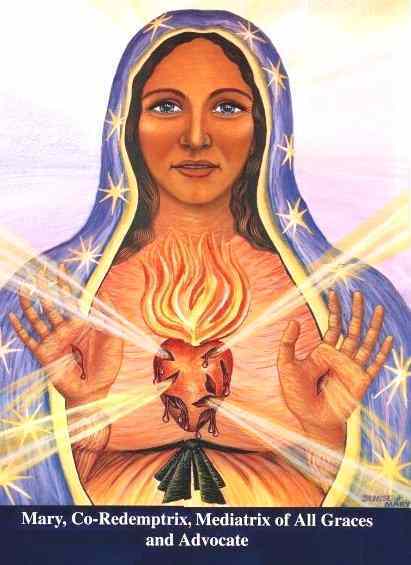 She is called the Mediatrix of all Graces. Look at this creepy graphic that shows MARY WITH SCARS OF CRUCIFIXION IN HER HANDS! Sick, sick, sick! Hell, hell, hell to all that go along with this. Take notice of the titles given to her. There was a Romanist newspaper ad that had a huge picture of the Catholic Mary lookin' pious. It said something like "He hasn't said no to her in 2,000 years." They think Jesus takes His instructions from Mary! They think that the Lord of Lords and King of Kings is a mama's boy! They can't ask Him for nothing directly, gotta go to mama. This is totally unbiblical--but it is consistent with pagan goddess worship including ROMAN mythology where you can beg lesser gods to help you out. God hates this and every time a Catholic chants the rosary (vain repetition) or prays to Mary, it is an abomination in His sight. I went out to EWTN, that bastion of Romanist wickedness and found a writing by Mr. William G. Most, a priest. As I read the article, the term "mama's boy" popped into my mind. In Romanism, Jesus is simply a child of Mary that was victimized (they call Him, "The Victim"). They pray to her so she will tell Him what to do because she is His mother. They actually believe Jesus is a "mama's boy." This in no way resembles the Jesus of the Bible. They eat Jesus and pray to Mary. That's messed up. In their idols/abominable images, you often see a dead jesus (like on a crucifix) or a funny lookin' baby Jesus in Mary's arms like she gotta protect him and speak for him. At Christmas, that Romish holiday, you see a baby Jesus with the sun around his head--why? We are never commanded to remember His birth. Salvation was a man-sized job and it was His total purpose in coming here. "... in suffering with Him as He died on the cross, she cooperated in the work of the Savior, in an altogether singular way, by obedience, faith, hope, and burning love, to restore supernatural life to souls. As a result she is our Mother in the order of grace." 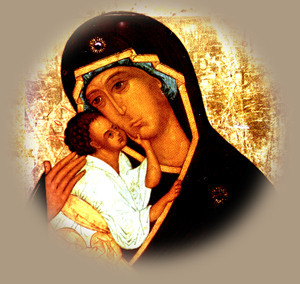 This motherhood of Mary in the economy of grace lasts without interruption, from the consent which she gave in faith at the annunciation, and which she unhesitatingly bore with under the cross, even to the perpetual consummation of all the elect. For after being assumed into heaven, SHE HAS NOT PUT ASIDE THIS SAVING FUNCTION, but by her manifold intercession, she continues to WIN (telling Jesus what to do) the gifts of eternal salvation for us. By her motherly love, she takes care of the brothers of her Son [so we are just all her little children--Jesus included!] who are still in pilgrimage and in dangers and difficulties, until they be led through to the happy fatherland. For this reason, the Blessed Virgin is invoked in the Church under the titles of Advocate, Auxiliatrix, Adiutrix, and Mediatrix. This however it to be so understood that it takes nothing away, or adds nothing to the dignity and efficacy of Christ the one Mediator [what?!??!! They just said she is Mediatrix! Satan has bewitched papists so that they won't even see the blatant contradictions in this one paragraph]. For no creature can ever be put on the same level with the Incarnate Word and Redeemer [that's what you have just done, you heretick and blasphemer!]...." Neither is there salvation in any other; for there IS NONE OTHER NAME UNDER HEAVEN GIVEN AMONG MEN WHEREBY WE MUST BE SAVED! A papist may say to me, "We don't worship Mary". Yes you do. You worship at your creep show of icons, images, and relics continually. If you have disregarded the Bible for Roman tradition, you willingly worship according to a lie. You willingly kick the Bible to the curb and the judgment of God is on you. They always show a dead Jesus. I suppose that this is fitting as their Jesus is indeed dead. In fact, he never lived. He's just some flour and water. The argument goes like this. Since Mary gave birth to Christ and cooperated ill [sic] salvation, would it not be logical for her to play a role in the distribution of her Son's graces? The Catholic Church says yes, to the point of maintaining that all graces that come into the world from the Godhead, flow through her exclusively. This concept is called the "Marian Prerogative." All is the operative word here. All graces means actual grace, habitual grace, infused grace, sacramental grace, the gifts of the Holy Spirit and charisms. All people means that every person without exception in every age, including those living before the Redemption, received saving grace in recognition of the future merits of Mary. Whether or not we acknowledge the fact of Mary's dispensatrix role is irrelevant. All grace flows through her nonetheless. If they don't worship Mary--then HOW IN THE WORLD can they claim her to be a co-redeemer with Jesus Christ and NOT WORSHIP HER? Everything they do points to the fact that they do indeed worship Mary and kick Jesus to the curb. Although there has yet been no solemn definition of Mary as Mediatrix of All Graces, there seems to be enough support from Sacred Tradition and the teaching office to qualify this title of Mary as a de fide divina--a truth formally contained in divine revelation. Father Carol gives further evidence to undergird this claim: 1) The doctrine is taught categorically by the modern popes; 2) is taught by them in public documents as well as private letters; 3) has been instituted as a liturgical feast (Mary as Mediatrix of All Graces, Benedict XV); and 4) papal teaching is seconded by theologians.